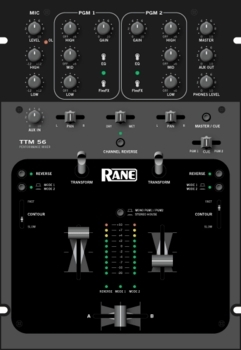 Rane TTM56 Performance Mixer DJParts - All Variety of Parts that DJ Needs. 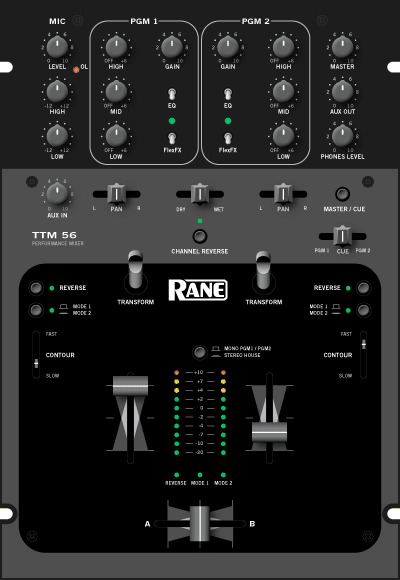 Rane takes performance mixer design as seriously as performing DJs take their art form. The TTM 56S is flexible, durable, and feature packed. The audio quality of the TTM 56S qualifies it for use in the most demanding live venue, recording studio or live broadcast applications. Rane＊s patented magnetic fader is the fastest, most accurate, and longest lasting on the planet. The design uses non-contact magnetic position sensor technology previously reserved for the most demanding aerospace and industrial applications. No travel noise - No bleed - Ever! Unlike optical non-contact faders, the magnetic fader is impervious to smoke, moisture, temperature and aging. The electrical performance is totally unaffected by use. The mechanical life of the magnetic fader exceeds 10 million operations. These magnetic faders know exactly what your hand is doing! A proprietary curve-translation module converts your hand motion into precise audio level control. Each of the Crossfader and Channel Fader controls include a Reverse switch and an independent continuously adjustable Contour control, adjusting from a smooth blend to extremely fast cut. Rane＊s proprietary FlexFx effects loop switches route Program 1 and/or Program 2 to the effects loop. A Wet/Dry pan control gives the user total control of how much processed signal is in the mix. The effects loop is post-fader, so reverb and other delay effects respond to both Channel Faders and Crossfader without cutting off tails. The TTM 56S comes with a removable C13 power cord that is easily replaceable if you lose yours. This mixer will operate anywhere you can get voltage from 100 to 240 AC. All four inputs are Phono/Line switchable on the rear panel - plug in 4 turntables or 4 CD players, or any combination.